Li Bai is a renowned Cantonese restaurant that is somewhat hidden away in Sheraton Towers Singapore. The restaurant is well known amongst loyal diners who appreciate the careful use of ingredients in every dish. if you are thinking of a staycation at the Sheraton Towers Singapore, click HERE to check out my previous stay in a Towers Pool Room which offers direct pool access and a small private balcony. Since this was a media tasting for Chinese New Year, the first dish is obviously a Yu Sheng Lou Hei. However, Li Bai's version is extra fancy since it utilises lobster sashimi instead of the usual salmon found in other restaurants. Speaking of Yu Shengs, if you do intend to get takeaways from Li Bai, the Salmon Yu Sheng is S$52+ and S$96+ for a small and large respectively. If you like your Yu Sheng extra fancy, check out the Abalone 'Loh Hei' Platter for S$88+ and S$148+ for the respective sizes. 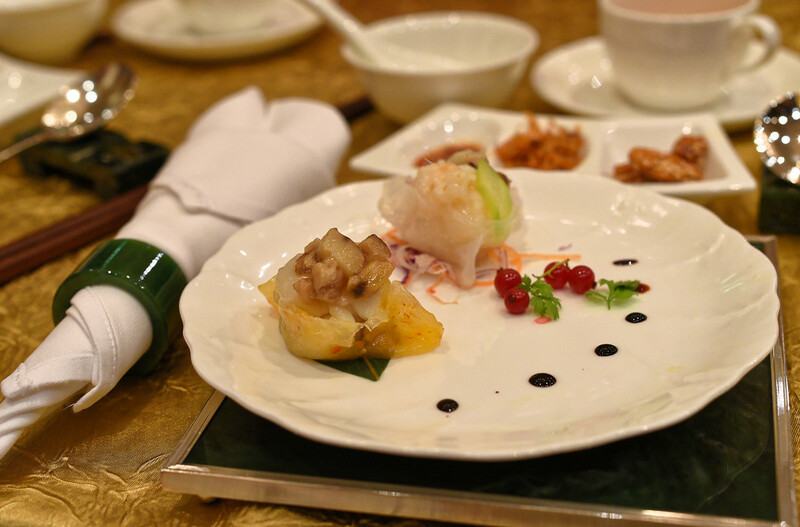 The first dish on the menu was a combination of popular dim sums served at Li Bai. This is not part of the Chinese New Year menu as it is a dish that you savour outside this festive period. Soups are a staple in Chinese cuisine - the Double-boiled Chicken Soup with Fish Maw, Morel Mushroom, Pearl Meat, Bamboo Pith and Tientsin Cabbage is an amazingly warm and hearty soup. The use of Pearl Meat in this soup gives the dish body and a balance of flavours. It is worth noting that Shark's Fin is no longer served at all Starwood properties worldwide and therefore you are not going to find Shark's Fin in any of the dishes here. While I personally do not advocate consuming Shark's Fin, it is understandable that some of the older generation may still prefer this prized delicacy. The lobsters were sautéed Cantonese-style and was served in an edible crispy rice basket which was interesting. Apart from the lobster which was masterfully cooked, I did not think the other components of this dish were particularly amazing. If you are looking for an alternative to the Pun Choy (which translates into Treasure Pot) this Lunar New Year, the 'Eight Treasures' Duck with Abalone is a great substitute. With sizeable 5-head abalones, spiked sea cucumbers and a beautifully braised duck, this dish is truly the dish that stole the limelight for dinner. Apart from the delicious and consistent braised sauce, the individual components of this dish were all masterfully executed. The sea cucumber had the right texture and crunch, the duck was incredibly tender and the abalone was moist while retaining some of its natural sweetness. If you do want to takeaway this dish to impress your relatives, it is available at S$388+. My personal favourite in this simple dessert is the Water Chestnut Cake with Osmanthus Fragrance. With a light and refreshing flavour from the Osmanthus flower as well as the crunch from the Water Chestnut, this is a perfect ending to an otherwise heavy meal. Most of the Chinese New Year dishes are going to be weighed down by an excellent braised gravy but at the end of the meal, what you need is a dessert like this for a sweet finish. The Water Chestnut Cake with Osmanthus Fragrance is available for takeaway at S$46+. This was an invited food-tasting session by Sheraton Towers Singapore.